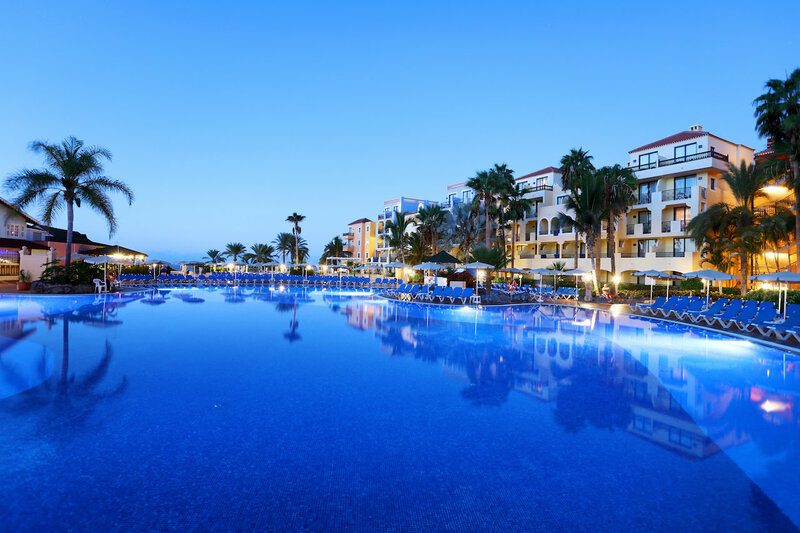 The Sunlight Bahia Principe Costa Adeje in Tenerife is a good 4* all inclusive hotel situated 9km from the resort of Costa Adeje. There are 4 à la carte restaurants available, as well as the Mirador buffet restaurant and pool bar both serving international cuisine. The hotel has a formal dress code for dining and reservations for the à la carte restaurants is required. Three of the à la carte restaurants are included per week with all inclusive accommodation, subject to availability. Local alcoholic drinks are served from 10:00 to 23:00. There is a 24 hour snack and soft drinks service. Minibars are restocked daily with soft drinks, water and beer. There are 3 room types, with 498 rooms at the Bahia Principe Costa Adeje, they all have air conditioning and a balcony / terrace. The lead in room is the Standard room sleeping a maximum of 3 adults or 2 adults and 1 child, furnished with a choice of twin beds or one kingsize. The Standard Sea View is the same as the Standard with a partial sea view. The Junior Suite sleeps a maximum of 3 adults or 2 adults and 2 children, furnished with twin beds / kingsize and a sofa bed in the living area. There is gym and spa onsite with sports activities including waterpolo, basketball, aquaerobics and aerobics. A large infinity pool and children’s pool. A kid’s club is available all year round for children aged 3-7 years and 8-11 years. The Bahia Principe Village has shops and live entertainment in the evening. Guests can also use the facilities and restaurants at the Bahia Principe Tenerife. Sports facilities include a squash court, tennis courts and mini-golf. The hotel has a free daily shuttle bus service to the beach at Playa de Las Américas. Situated 2km from Playa Paraiso. Airport shuttle transfers from TFS approximately 25-40 minutes. Special offer to book a standard room and receive a free upgrade to a side sea view room! Subject to availability offer published 07/04/19. Other dates and regional airports available. Please contact us on 0800 810 8404 or send an enquiry.